Garry Frank was a valued offensive lineman at Mississippi State, where he demonstrated versatility playing center and guard on offense, and nose guard on defense. Frank was also a distinguished shotput and powerlifting champion. He’d be selected in the 7th round of the 1988 draft by the Broncos. After being released by Denver, Frank signed with the Atlanta Falcons, but spent his entire season on injured reserve. 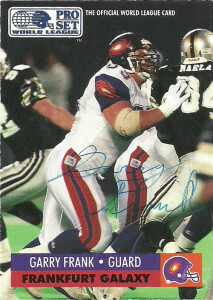 In 1991 Frank was selected by the Frankfurt Galaxy of the WLAF during the first round of the offensive line portion of the draft. It was a homecoming of sorts for Garry as he was born in Germany. After the season he’d earn First-team All World League Honors. After the season he signed a free agent contract with the Kansas City Chiefs, but did not make the squad. He’d play again for the Galaxy in 1992 and return stateside when the league decided to reorganize after the season. Frank returned to the weight room where he became a force in the weightlifting community setting world records in power lifting.